Over the course of the last year, there have been a number of changes to the game's meta. Players are attacking with war-grade armies and, many, are using expensive troops when they do so. I still see the standards - BArch, GiBArch, Goblins, GoWiPe, GoWiVa - but the last few months have been particularly active with Balloons and Lavahounds. Understanding the pathing of these troops allows base designers to anticipate how they'll react to defenses and "junk buildings". The typical open base has three rings leading into the hub. The outermost ring is comprised of resource and army buildings; things non-specific target troops will go after. The second ring is comprised of the first layer of defenses. Ground troops that target defenses, will immediately walk to this ring and then proceed to walk around the core. As they walk around the base, they will come under fire from both the core as well as the defenses in the second ring. Defense targeting air troops will stop here for their first run and receive damage from both this and the hub. The innermost ring is also a resource ring and this is where gold and elixir storages reside. This ring is most protected by the defenses in the core of the base. Non-specific targeting troops that reach this inner ring spend a lot of time beating on storages, under heavy fire from core defenses. Ground based, defense targeting troops tend to walk around the second ring before moving to the hub. The core itself is designed to maximize defense for both protection of the dark elixir storage as well as the ring immediately outside the core. 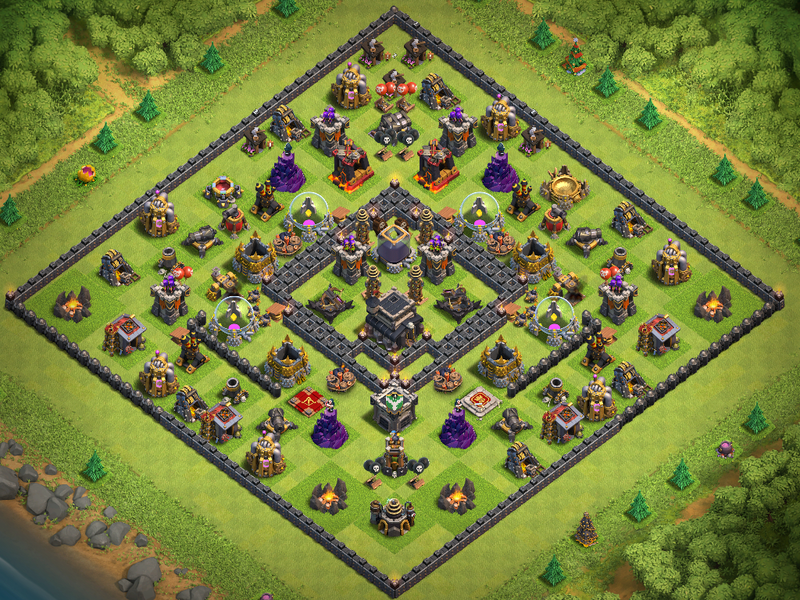 The Hidden Tesla farm surrounds the dark elixir storage and X-bows are set to air to provide the best protection possible for the core. 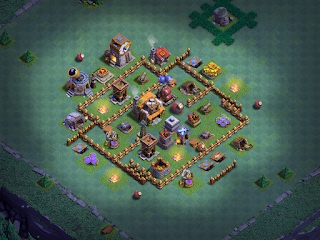 In v3.0, the TH has been moved down so defenses can be better clustered around the dark elixir storage. Archer Towers and X-bows can be switched in the core to meet whatever attack style seems to be prevalent to the meta at the time. Traps are also carefully placed for maximum impact. For example, notice the positioning of the spring traps; the wallbreaker AI will send them straight into these or nearby bombs, so anyone who spams wallbreakers or only carries 4-6 will not be able to break the walls using them. Around the base, air bombs have been placed to catch the Queen Walk off guard and attack Healers. This is particularly important on the TH9 version; the north of the base looks like it's vulnerable to a Queen Walk when it's actually well armed to take out the Archer Queen's healers. On the TH10 base, Inferno Towers in the corners shore up the corners of the base in general and keeping them set to multi-target means they hit a lot of troops walking the rings. One big change - v2.0 of this base set X-bows to ground to increase their range. The meta now favors using them to defend against air attacks so they've shifted to air. The top of the base looks like it's weak; this is where we want players to break into the base. By all rights, this is the perfect place to launch a Queen Walk, use Wallbreakers to take down the outer wall so other troops can pour in.... It turns out that this may not be as good an idea as it looked like during that 30 second review time. The bottom of the base has both point and splash damage as well as the Clan Castle (CC). The CC, along with the heroes (when up), factor heavily in defending the bottom quarter of the base. While enemy troops fight CC troops and heroes, nearby defensive structures take them out with splash damage (Wizard Towers and Mortars) and point damage (e.g., Archer Towers and Cannons). This base is not 100%, though; absolutely no base design is unbeatable. Good attackers can beat it if they know how, but...they seldom have the right army composition to do so. I've had it running a while now and the results have been very positive. When the base gives up stars, it is usually with destruction in the 30%-60% range and every real attack has resulted in a 12 hour shield. 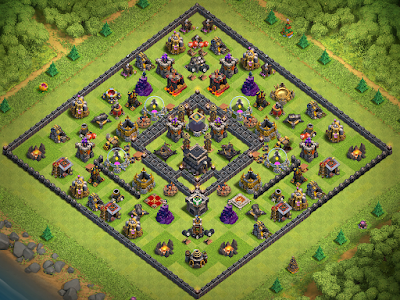 The TH9 version of this base will undergo further development over the next few months. The TH10 version is tried and true - I've run this for well over 9 months in this configuration and it keeps me high in Champs League on defensive wins alone. If you're using either rendition of this base, it would be great to hear how it's working out for you. Drop a comment and let me know!